I do teach these hard things, and sometimes I am at a loss to explain why. I don't think we can always explain the why behind the horrors of the past, but I think it is terribly important to talk about them. There is the saying, "Those who cannot remember the past are condemned to repeat it." and this is certainly true. However, I think we owe it to those who lived the horror to make sure our children are just as horrified so they will fight against it should it ever present itself again. A major poll taken last year of 53,000 people found that just 54 percent had ever heard of the Holocaust. Knowledge of Auschwitz is likely even more limited, particularly among young people. Past surveys have shown that nearly half of Britons had never heard of Auschwitz. Some schoolchildren even thought Auschwitz was a type of beer. The first night inside Auschwitz my father said we must separate because together we would suffer double. “On your own, you will survive,” he told me. “You are young and strong, and I know you will survive. If you survive by yourself, you must honor us by living, by not feeling sorry for us. This is what you must do.” That was the last time I ever saw my father. I’m grateful for my father’s words of grace and guidance. They echo in my heart even still. It’s a cruel thing, feeling guilty for surviving. But my father erased any future guilt and replaced it with purpose. It was a gift only a father’s wisdom could give. It gave me a reason to go forward, a reason to be. It does still. The author of this article still lives. This man lost his whole family. Here I sit in my warm comfortable home, typing away in freedom on my home computer--with all my children, husband, and parents too--still alive and living well. What would it mean to lose everyone I loved? We are not talking about the ancient world or even the middle ages. This was only 70 years ago. What would it mean to me to have to keep going? But at 86, another part of honoring my father’s wishes requires being a voice for the voiceless. Indeed, as parents, educators, and citizens, we must all do our part to help ensure that “Never Forget” remains much more than a threadbare catchphrase that gathers dust and loses meaning with each passing year. I agree. I remember. I will help my children remember too. Last year I discovered Trim Healthy Mama. I have found that eating (mostly) this way is a good way to manage my weight. Some of my friends have lost a lot of weight eating this way and have kept it off. I like the theories behind it, but it doesn't work for everyone as I found when I tried to help my husband. Some bodies don't like grain carbs at all and require different methods. That's when I found out about the Ketogenic Diet. The Keto Calculator helped me determine what would put his body into Ketosis mode so that he could burn the weight off. So then I went to work figuring out protein, carbs, and fats in grams that would help him lose the weight he wants to lose. It is a pretty fascinating science and these are some of the recipes that I have come up with. Interestingly, they work as S meals in the Trim Healthy Mama way of eating too. 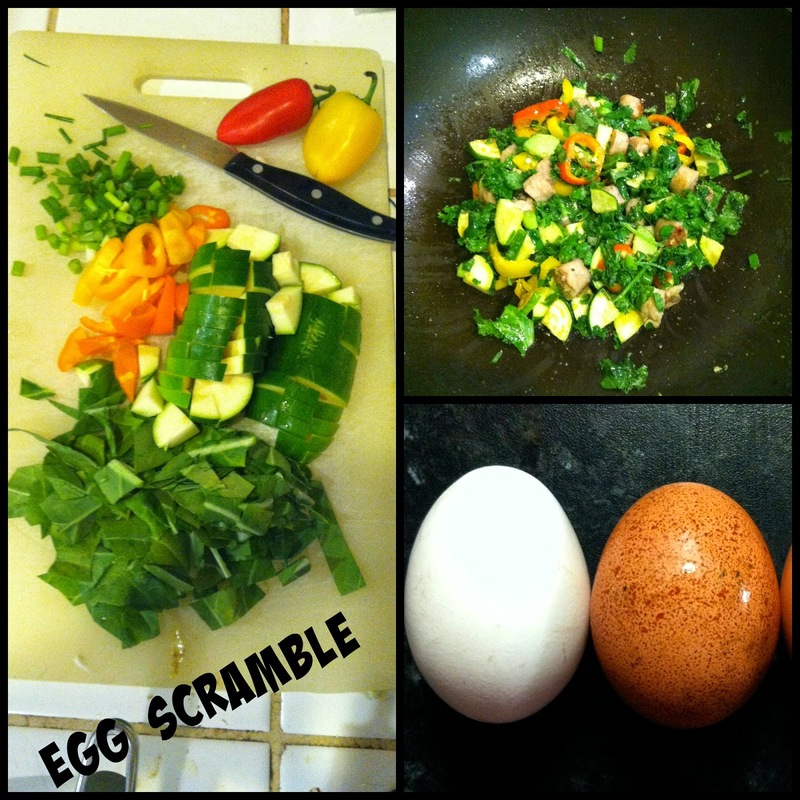 This is the breakfast egg scramble I make at night (or he makes in the morning) and it is a good balance of veggie carbs, protein, and fats. This is comprised of 1/2 a zucchini, two green onions, two small sweet peppers, some collard greens, three eggs, and a tablespoon of butter. This is then topped with half an avocado. I add spices depending on my mood so sometimes he ends up with hot peppers and sometimes chili powder and cumin. Sometimes I add fresh cilantro. I try to keep it different so he doesn't get bored. 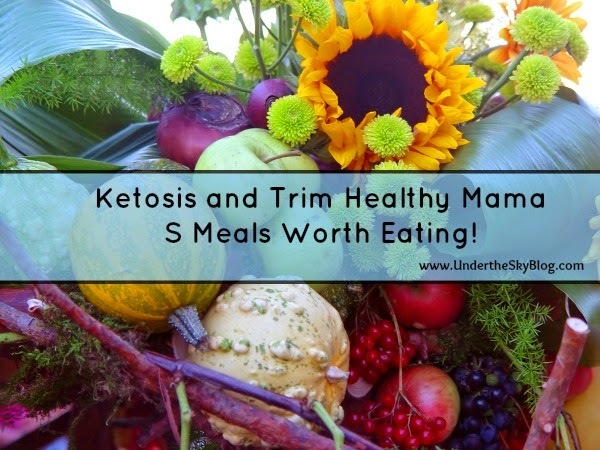 I will not always give specific measurements for most of these simply because if you are on the ketogenic diet, you will need to gear it to your own weight loss goals and the food amounts might be different for you. This would be too much food for me if I was in active weight loss mode. I was genuinely surprised at how many carbs are found in veggies! These are not bad, but in the ketogenic diet, you still have to be aware of them. Heat up your pan until it is nice and hot and add the oil. If using fresh garlic, mince and toss in the oil. Wait 30 seconds and then add the broccoli, onions, and garlic powder if you are using that instead of fresh garlic. Allow it to cook until it gets just a little seared on the bottom. Flip and cook the other side and add the pork. Cook until bright green and then squirt the Liquid Aminos over the top. Toss for 30 seconds and remove from heat. Set aside until cool and place in a take-to-work container. Lunch is done. This is something I threw together on the fly so I definitely won't have measurements, but you can figure out what a serving looks like for you depending on what you take from the baking pan. This was made for the whole family and everyone loved it. The last dinner is similar to the lunch, but is interchangeable because the veggies and spices are only limited by your imagination. I cook with fresh ginger and garlic a lot. I often add soy sauce or Bragg's to the mix (depending on my mood, quite honestly). 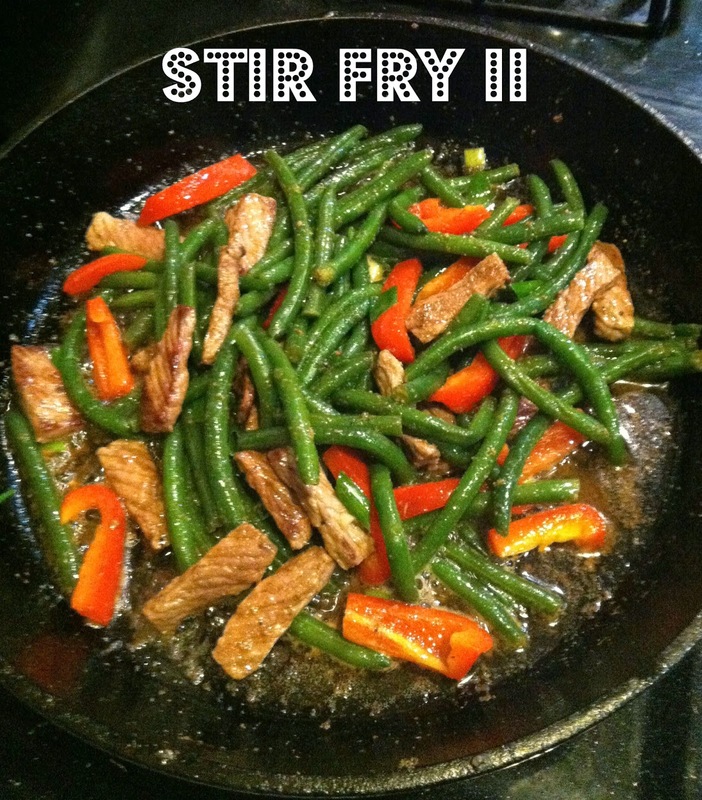 This one has ginger, garlic, red bell pepper, green beans, and soy sauce sauteed with sliced beef strips. 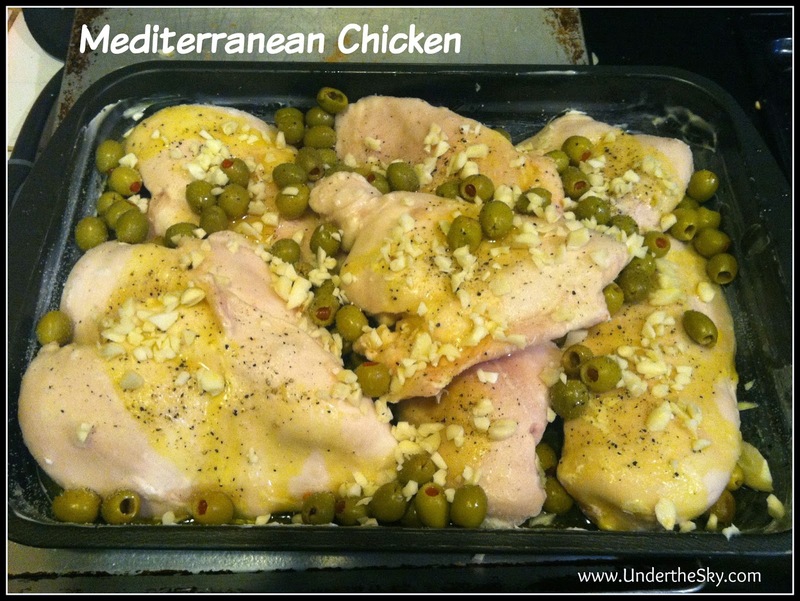 I cooked it in olive oil. The red bell pepper adds a nice extra flavor. One of the things I like about stir fry so much is that you can make a lot for not very much money. I often add cabbage to my stir fry because it goes a long way and everyone loves it cooked in this manner. We have five children so I will cook brown rice to go under this when I make it for the family. The kids are definitely not dieting and they need the energy the grain carbs give them. I hope you found something worthwhile here. 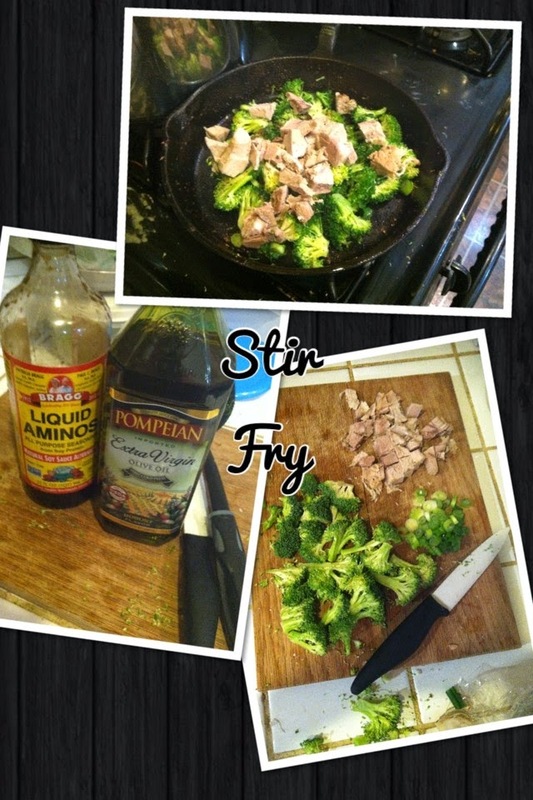 Eating can still be delicious even when you are trying to lose weight. I have enjoyed the spices and have had a lot of fun trying new things. I couldn't believe how much I liked roasted cabbage with olive oil when I first tried it! What are you eating that is new to you this year? I was privileged to review BiblioPlan, Year One, last year. 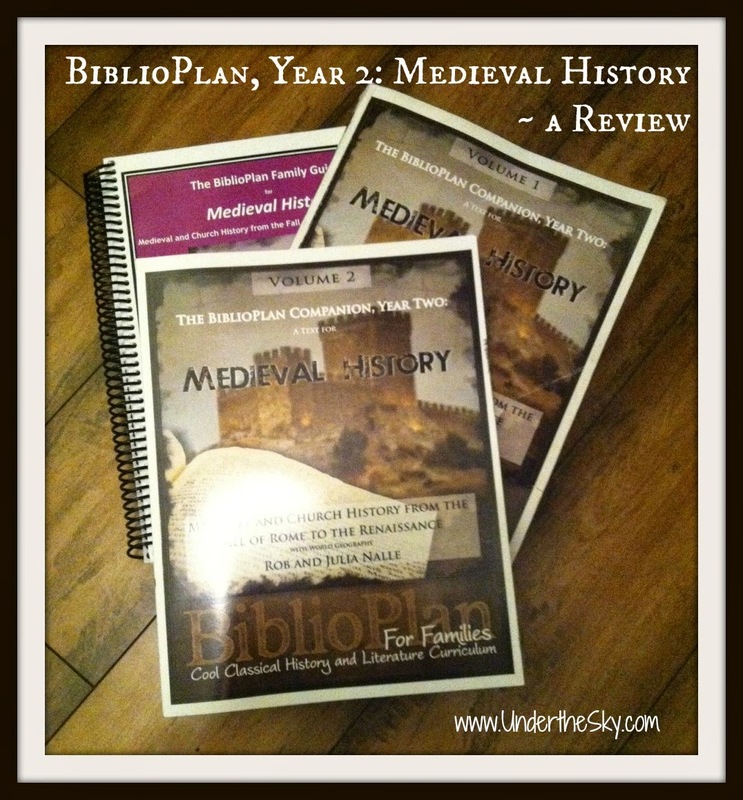 This year, we have been using BiblioPlan, Year Two: Medieval History. This covers the period of time from the Fall of Rome through the Renaissance (400-1600 AD). It follows in the same format and is just as comprehensive and interesting as Year One! If you are looking for a Christian-focused history curricula that blends both the secular and the sacred, you will find it here. By comprehensive, this is what I mean. Year Two covers the following subjects: Medieval History, Church History, Geography, Biography, Literature, Art History—and more—all with the focus of glorifying God. The BiblioPlan Family Guide for Medieval History is the framework to the whole the program and is an invaluable resource. It begins with a weekly schedule and builds from there so your history study doesn’t lack any aspect you might want to give it. This is the book that has detailed reading lists, directions, explanations for use, schedules, mapwork suggestions, other history resource books (with page numbers), writing ideas, and hands-on activity suggestions. This is a highly valuable book and is truly the key to the whole of the program. The reading lists are one of the best aspects of this book. Broken down into age/grade range, the literature selections are detailed and complete. You will find reading lists for grades K-2, 3-5, 5-8, 7-8+, high school, family read-alouds, movie suggestions, hands-on activity books, audio resources, general books on the time period, literature study guide options, and other online resources. It also includes a listing of free downloads like audio books available online. (Page 62 is especially exciting if your family enjoys audio books!) For each recommendation, they give a good description of the resource. If there are any possible concerns with a title, they are kindly noted. If you are stumped by the many choices out there for good medieval-focused literature and other resources available, this book will help you determine which ones are the best choices for your family. A hardcopy is $42.95, and the e-book version is $32.95. It is entirely usable as an ebook. This book is worth its weight in gold and is a tremendous resource for studying the medieval period. While the BiblioPlan Family Guide gives detailed page suggestions for each weekly topic from other homeschool-friendly history books, the program is best utilized when paired with The BiblioPlan Companion, Year Two: A Text for Medieval History. This is an amazing two-volume resource with a total page count of 766! This is more than double the pages in the Ancient History Companion! It is a softcover resource that contains the widest variety of subjects you’d expect to find during medieval times! The main three focus areas found in the Companion are: Medieval History, Church History, and Geography. Within those three areas, you will find both church and secular biographies, landforms, bodies of water, fascinating facts, stories of lore and battle, dates, events, people and how they lived, as well as the details behind all sorts of intriguing happenings! Geography: Locate France, identify the bodies of water around it, locate the three mountain ranges important to France, and identify the four major rivers. If you are using the map supplement discussed below, this is all done in one good lesson. You will also study the Rhine River, the castles found on the river, and the massive rock outcropping known as The Lorelei. Medieval History Focus: Roman Gaul (France) – history and timeline, study the Île de la Cité (“Island of the City”) in Paris, Vercingetorix and the Battle of Alesia, history of the Franks, Alemanni, Bergundians, the story of “The Ring of the Nibelung,” the Huns, Attila the Hun, the Battle of the Catalaunian Plains, “Fascinating Franks: Merovius and the Merovingian Dynasty, King Clovis I and how he won the kingdom, his battles, and conversion story. 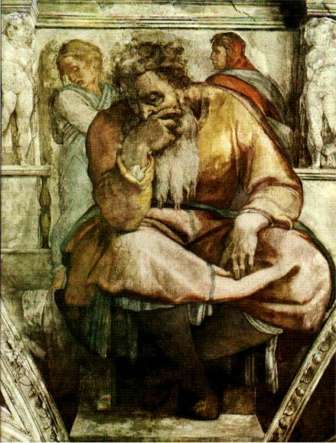 Then you study the conflict between Roman Christianity and Arian Christianity, and the Salic Laws. Church History Focus: Giants of the Faith: St. Martin of Tours, St. Genevieve, the “Flying Bells” of France’s churches, and Notre Dame Cathedral. This is all covered in one chapter. So you can see, there are some really fascinating subjects! It is expected that you will cover one chapter per week. With the many resources noted in the Family Guide, you can flesh it out or stick mainly with the Companion and the map work. It is entirely up to you. The physical copy for both volumes of the Companion is $109.95, and the e-book version is $39.95. This book has many full color photos and maps that might be less usable/readable on an e-reader. Much is going to depend on your reader as to whether or not you spend the extra $70 for a physical copy of the book. I recommend the physical as it is much easier to use with a family. • Discuss some similarities between “The Ring of the Nibelung” and Tolkien’s Lord of the Rings trilogy. payments that the Huns demanded, and how they added to the general terror of a Hun invasion. • Retell the story of how Clovis convinced Chlodoric the Parricide to murder his own father. • Describe Clovis’ vision at the Battle of Tolbiac. Discuss how the Conversion of Clovis brought Roman-style of Christianity to France, driving out the old Arian-style Christianity that the Goths had learned. • Discuss how the Salic Laws divided Frankish kingdoms when Frankish kings died. Debate the wisdom of the Salic Laws. • Retell the story of St. Martin and the Beggar. This is also a great resource to use if you are using BiblioPlan in a co-op setting. These are great questions for the group as a whole. The hardcopy is $11.95, and the ebook is $8.95. This is worth it! BiblioPlan’s Cool History resources are available in ebook or physical format for each developmental level: Littles (grades K-2), Middles (grades 2-6), Upper Middles (grades 6-8), and Advanced (grades 7-12). The Cool Histories are an excellent tool to help your child write down what he is learning to facilitate better discussion and retention of the awesome history they are reading through the Companion. The Cool Histories have fill-in-the-blank questions, essay questions, research options, and other activities for each level noted above. What does the word Rhine mean in Celtic? What is the English name for the old stone bridge that connects Paris’s Île de la Cité to the banks of the River Seine? How did the Huns sometimes feel when they dismounted from their horses? Why? Who was the Huns’ most fearsome leader? ACTIVITY: Have an Easter roll contest. Roll one raw egg per child down a gentle slope and see which one survives. In France, the surviving egg is called the “victory egg,” and it symbolizes the stone that was rolled away from Christ’s tomb. Review the seven continents and the five oceans. Locate the Mediterranean Sea, the Black Sea, the Arabian Sea and the Red Sea. Point out several rivers on the globe, including the rivers from Year 1 (Nile, Tigris, Euphrates) and the Rhine River. Rivers contain fresh water and carry their water into another river, a lake, a sea or an ocean. Locate France and identify the bodies of water that surround it. What made Clovis decide to abandon his pagan gods and follow Christ? When Clovis was baptized, a dove carried something down from heaven in its beak. What was it? Name the special laws that Clovis put into place for the Franks. What did St. Martin do when he saw a beggar freezing beside the road? What special thing do French churches do every year on Good Friday? Geography work is found in their map supplement and is not included in the Cool History for this level. More on the Hands-On Maps below. What might the tribal name “Franks” mean? What might the tribal name “Alemanni” mean? What made Attila the Hun shift the focus of his attacks from the Eastern Roman Empire to the Western Roman Empire? What two military commanders fought the Battle of the Catalaunian Plains? Who won? What promise from Clovis made Chlodoric the Parricide murder his father, Sigobert the Lame? Under the Salic Laws, what happened to a king’s territory when he died? How did St. Martin of Tours help the beggar whom he saw freezing beside the road? How did the pagans of Gaul test God’s power and Martin of Tours’ faith? What did Genevieve encourage the people of Paris to do when Attila was threatening their city? 1. In 450 AD, Attila the Hun received a message that made him shift the focus of his attacks from the Eastern Roman Empire to the Western Roman Empire. Who sent him that letter? What did it say? Based on that letter, what did Attila demand from the Western Roman Empire? 2. What promise from Clovis made Chlodoric the Parricide murder his father, Sigobert the Lame? How did Clovis betray his promise to Chlodoric? 3. In 1337, King Edward III of England tried to claim the throne of France. On what grounds did he base his claim? On what grounds did the Franks deny his claim? In Wagner’s Das Rheingold, what power does the Rhine gold give to the one who takes it? What must the one who takes it give up before he can use this power? Who takes the Rhine gold? Families who purchase these materials may make as many copies of the Cool History assignments, Maps, Timelines or Coloring Books as they need for use WITHIN THEIR FAMILY ONLY. I really like the Cool Histories and think they are well worth the price. I’d check over the level of questions for the year of BiblioPlan you are considering and buy one to be used for the closest age range. I tend to teach to my oldest and modify for my younger children. This has served me well for a long time and I recommend it here. It is easier to simplify (and cross off more difficult questions) than it is to “spruce it up” for an older child. * Label the Baltic Sea, North Sea, Atlantic Ocean, Baltic Sea, Mediterranean Sea, and English Channel. Lightly color the waters blue. * North of the Alps, the blue line represents the Rhine River; south of the Alps, it represents the Rhone River. Label the Rhine River and draw a castle or two along its banks. Alemanni inside the dotted lines. * Find the red dot on the map and label it Paris. This is where Clovis built his capital. * Cross out the word Gaul and replace it with France. Challenge: Can you label SPAIN, ENGLAND, GREECE and ITALY on the map? * Label the bodies of water. Don’t forget to label the Bay of Biscay. North of the Alps, the blue line represents the Rhine River; south of the Alps, the blue line represents the Rhone River. Label both rivers. * Label Scotland, Denmark, Ireland, Greece, Italy, Norway, Sweden, Finland, England, Spain and Gaul (France). * The dotted lines indicate the extent of Clovis’ Empire. Write inside the dotted lines Franks, Burgundians and Alemanni. * Label the red dot on the map Paris. * Label France’s three major mountain ranges: the Pyrenees, the Alps and the Massif Central. Challenge: Using the map in the Companion, draw in the modern‐day borders for Switzerland, Belgium and Germany. These are solid resources that work well and in conjunction with the whole program. I have tried using other maps and they don’t work as well as these do. I definitely recommend them. I get a little giddy when the kids are cracking open our geography books and maps and trying to locate what they need to find. I think that is because I really value geography and love how this resource makes the kids think. They need to do the work and this helps them remember what the find. The focus on geography along with history is one I love as it blends something that is very naturally blended. Hands-on Maps for Middles runs $13.95 for the ebook and $21.95 for the physical copy. Advanced will run $16.95 for the ebook and $24.95 for the physical book. I use the Advanced for any middle-high school child in the family and this works well. I recommend the ebook so you can print what you need within your family. BiblioPlan also created medieval Timeline and Timeline Figures for use with their program. These are an inexpensive way to buy and create a timeline with your family. For only $13.95 in ebook or $21.95 for the hardcopy, you can make a complete timeline for the medieval time period. I received the ebook and each page has two parallel purple lines that go across the page. The top one says Church History and the bottom one says Medieval History with the dates noted. Underneath each purple timeline you will find events and people written out in the correct place. You affix the appropriate photo, graphic, or drawing created for that person or event right where it is supposed to be. There is no guesswork with this product and that is my favorite part of the timeline! You are not going to glue something down in the wrong spot and regret using glue (the very thing I have done with other products!) There is a wide variety of graphics, photos, and drawings and all are great choices. Someone spent a lot of time finding these figures for our use and this is a real treasure if you want to do a timeline with your children while using BiblioPlan. If I was going to use this with more than one child, I would definitely buy the ebook version so that I could print out the timeline as we studied it and print as many as I wished for my children. You can also print this out and create a wall timeline for the whole family to see and use. This is a valuable resource for a whole timeline. The Craft Book and the Coloring Book are extra resources to help you flesh out each week with hands-on fun. These are available for purchase separately. The Craft Book is $5.95 for the ebook and $11.95 for the physical book. The Coloring Book is also $5.95 for the ebook and $8.95 for the physical book. I’d definitely recommend the ebook format for both—especially the Craft Book. This is color-coded with a different color per craft. It comes with a list of supplies for each craft and written directions with a photo of the finished product. This is a good beginning craft book. I’d love to see it revised with step by step instructions for the “less-than-crafty” among us. The crafts are varied and interesting and your children are likely to enjoy them. My children have enjoyed the ones we have done. The coloring book has simple drawings that accompany the lesson. They are not going to “wow” you, but if you need something easy to print off that coordinates with the lesson for your little one, this is a good choice. BiblioPlan is an excellent thorough program for any homeschool family! It is well done, easy to use, complete in all aspects, and totally usable for any family. This is a program your whole family will find interesting and will be drawn into the time period. The authors have done their homework, and used a wide variety of resources, to create these fantastic history programs for us. This was clearly a labor of love for the homeschool community and that absolutely shows in the finished product. Download the sample for BiblioPlan, Year Two: Medieval History, and look at it up close. You may find this is just what you have been looking for! This review will be published to The Old Schoolhouse Magazine's website in the coming weeks. It was completed for The Old Schoolhouse, but all opinions and statements are my own. 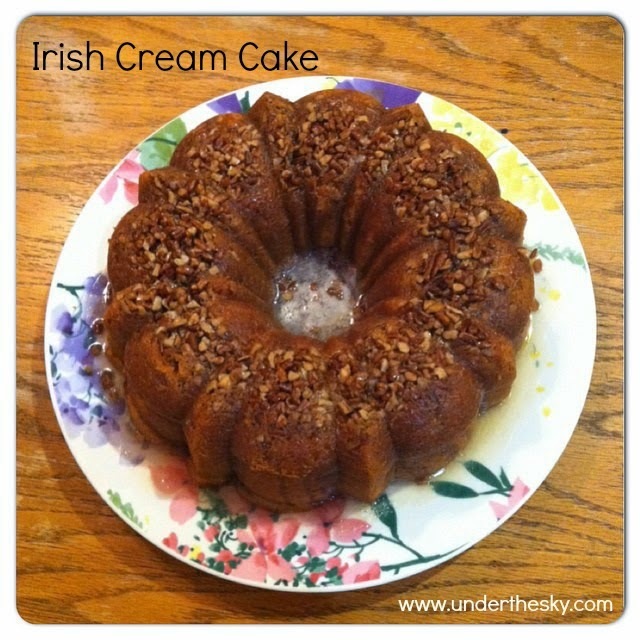 Irish Cream Cake - Deliciousness! This is one of those cakes that creates a memory in your mouth. If you like Irish Cream Liqueur (Bailey's or Carolans) - this is the cake for you. This cake is not carb free nor is it sugar free. This is the real deal. Modify at your own discretion. This is what it looks like just before you cut into it. Preheat oven to 325 F. Grease and flour a 10" Bundt pan. Sprinkle chopped pecans and coconut evenly over the bottom of the greased pan. In a large bowl, combine cake mix and pudding mix. Mix in eggs, water, melted butter (or oil), and 3/4 C Irish Cream Liqueur. Beat for five minutes at high speed. Pour batter over nuts/coconut in pan. Bake for 60 minutes, or until a toothpick inserted into the cake comes out clean. Cool for ten minutes in the pan so that it will pull away from the sides and come out easily when you invert it. While the cake is cooling in the pan, make the glaze. Combine butter, 1/4 C water, and 1 C sugar in a small saucepan. Bring to a boil and continue boiling for five minutes, stirring constantly with a whisk. Remove from heat and whisk in 1/4 C Irish Cream. Invert the cooled cake onto a serving platter. Prick the top and sides of cake with a toothpick. Spoon the glaze over the top and brush it onto the sides. Pour out all of it and leave to absorb for 30 minutes. After 30 minutes, cut and serve. This is a delicious cake. Enjoy!